Freemius, Inc. is an authorized reseller of “Starfish Reviews” and is the 'merchant of record' for your purchase. 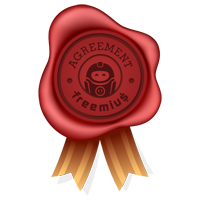 The agreement is between you and Freemius, Inc. on behalf of the Vendor behind “Starfish Reviews” (the “Vendor”). You may not assign or transfer it without Freemius’ express prior written consent. Freemius, Inc. resells and distributes “Starfish Reviews” and other plugins and themes "as is" and with no implied or statutory warranties, or guarantees that they will function exactly as you would like, or that they will be compatible with all third-party components and plugins. Product security and feature updates are included for free as long as your license is active. Updates will be delivered automatically from the WordPress admin dashboard or you can manually download the latest version of the product from your dashboard: https://starfish.reviews/account/#!/login/. Unless you purchased a ‘lifetime’ license, the product’s license is sold as automatically recurring subscriptions that renew each month or year (depends on the subscription's billing cycle) on the anniversary of the purchase date. Prices of “Starfish Reviews” are subject to change without prior notice or consent. If, during the first 14 days following the Purchase date, You are not satisfied with the Product for any reason whatsoever (no questions asked) and notify us that You would like to cancel Your Purchase, we will issue a full refund of the Purchase price.